Known mostly for their smart warfare systems – Milrem Robotics – is entering the commercial market with its firefighting and search and rescue unmanned ground vehicle being developed together with rescue services. The UGV known as Multiscope Rescue can be equipped with firefighting equipment such as a water tank and a remotely controlled water cannon. It can reach areas that are unreachable by human personnel or too dangerous for firefighters to go into like tunnels or other structures that may collapse at any time. The search and rescue unit can also be equipped with thermal cameras and powerful lights to find missing people in harsh environments or remote forested areas. ”Innovative technologies make it possible to not only keep humans away from dangerous places but to relieve them from doing dull and dirty jobs,” explained Kuldar Väärsi, CEO of Milrem Robotics. “Multiscope Rescue is one of the first commercial UGVs from many others to follow, since we are starting to focus more and more on the commercial markets,” said Väärsi, adding that more attention will also be given to AI and autonomy development. Mr Väärsi also stated that collaboration with Estonian Rescue Board has great significance and value for the company to develop new user-friendly unmanned and autonomous products. 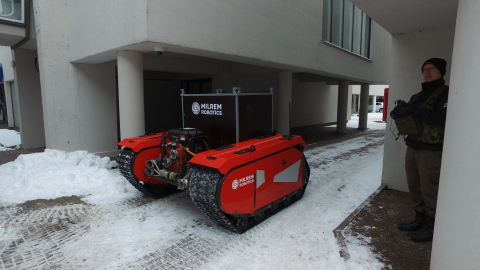 “It’s an excellent innovation project, where the experience and needs of the rescue field come together with product development by Milrem Robotics,” said Martin Lambing, head of the rescue department of the Estonian Rescue Board. “This kind of modern technology will allow rescuers to do their work more quickly and easily in rescue operations without putting themselves at risk. I can see rescue services of different countries implementing this kind of technology in the future,” Lambing added. Multiscope Rescue has been developed using know-how gained from designing and manufacturing Milrem Robotics’ well-known defence oriented UGV the THeMIS that has been rigorously tested during several military exercises in different climates. The Multiscope UGV has all the high technical capabilities of the THeMIS, such as a payload of 750kg, a diesel-electric drive and the ability to pass through difficult terrains. Milrem Robotics is developing its commercial UGV Multiscope also for agriculture and mining.